Growing up in India, I didn’t get to see a lot of snow. 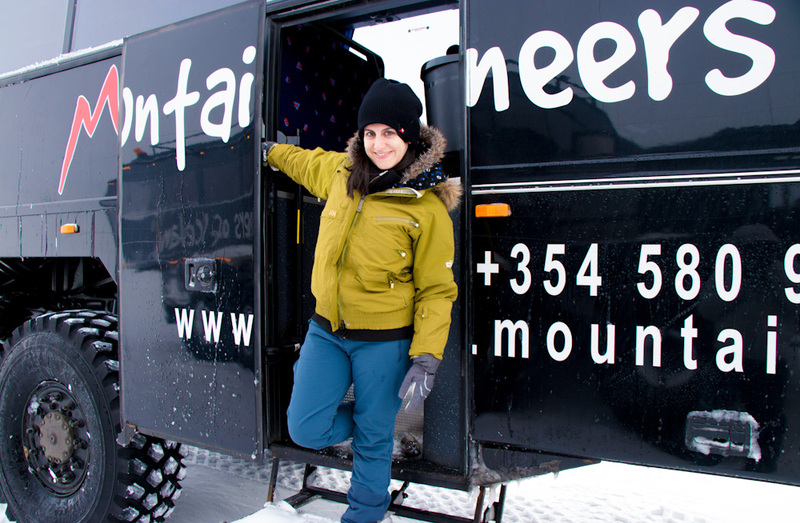 While snowfall is common high up in the mountains during winter, you still need to take a trip for several hours to get above the snow line. I remember the first time I saw snow in Shimla, a hill station in the north of India. I was seven and eager to make snowballs and throw them around like in the movies. But my woolen gloves didn’t hold up very well. We had taken a trip with some friends and there was a boy who was about twelve. He had better gloves and I lost that snowball battle. 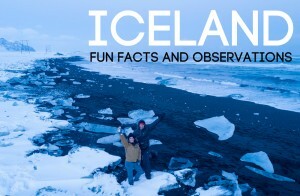 In retrospect, it’s a good thing that I learned that lesson then because woolen gloves would not have held up on our winter adventure through Iceland. As a child, I didn’t have a lot of experience with snow. 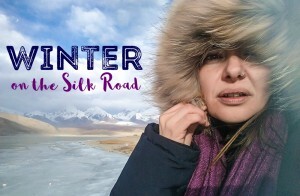 As travelers, we’ve seen the first snowfall of the year in Romania, dug out our car and watched the Northern Lights in Norway, traveled in Patagonia during the southern winter, and now even traveled in Iceland with snow all around. But I didn’t grow up with snowy winters. So I don’t actually know how to ski, snowboard, or ice skate. 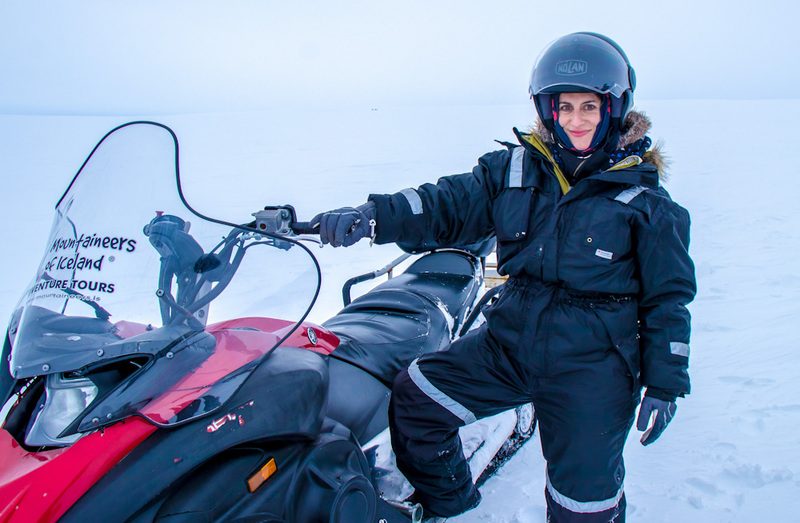 When I saw that the Mountaineers of Iceland could take us in a monster truck right into the heart of a glacier and then we could take a snowmobile out on our own, we had to try that out! The day began with a hot cup of coffee at our cabin near Selfoss. We then drove for an hour as the meeting point is near Gulfoss. 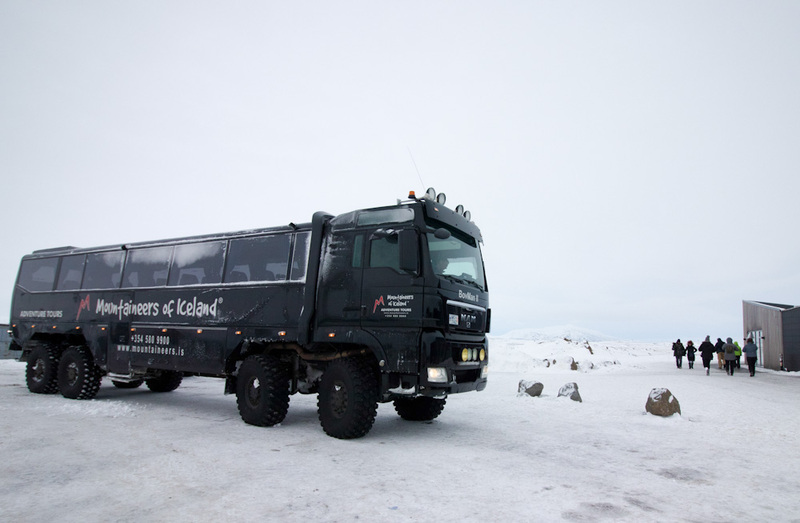 Once there it was pretty easy to spot the absolute beast that we were going to drive into the glacier on. A huge black truck with tires that are larger than a person. Several of them. It can plow through several feet of snow without a hiccup. We piled excitedly into the truck and it was another hour-long drive through frozen valleys, snowed in landscapes, and sometimes some pretty treacherous territory. There were several moments where we thought we’d get stuck in the snow but the monster just carried on. It’s incredible how our driver could find his way through the snow considering there are almost no visible tracks in the powdery white dust. After an hour of slowly making our way through a white blanket of snowscapes, we finally arrived at our base camp. We were on top of Glacier Langjökull. Usually, I associate a bright blue icy color with a glacier, but in this case, the entire landscape was covered in a thick layer of snow so all you could see was a flat white expanse all around. 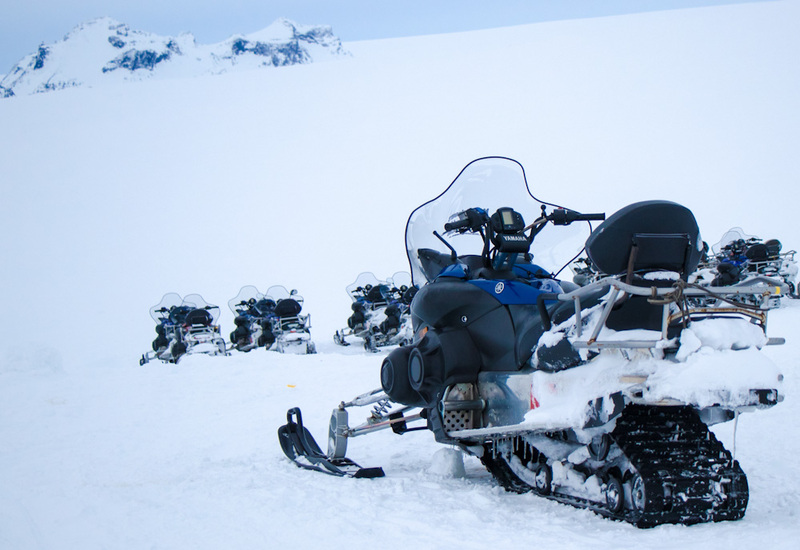 The Mountaineers of Iceland provide all the gear you need for your snowmobile adventure. You get thermal overalls, gloves, boots, a balaclava, and even a helmet. 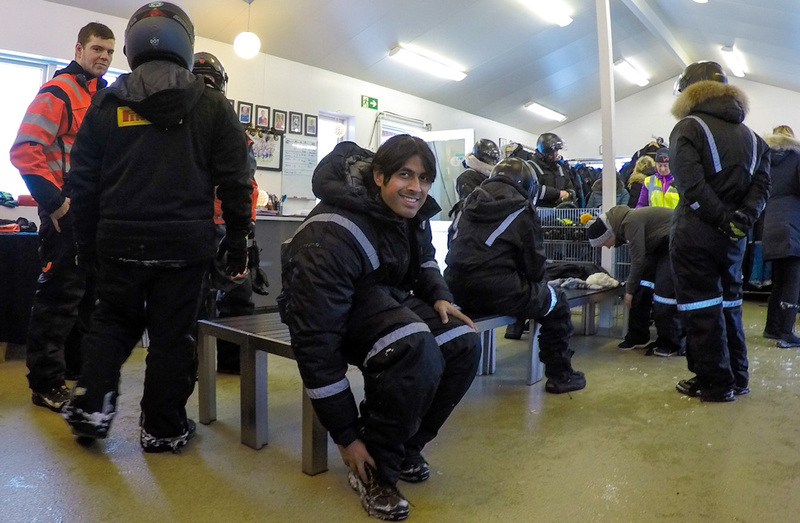 Once we got suited up, we headed out for a small demonstration on how to drive our snowmobile. If you’ve ever driven an electric scooter, a snowmobile is pretty similar. It doesn’t handle the same way but the controls are very much the same. 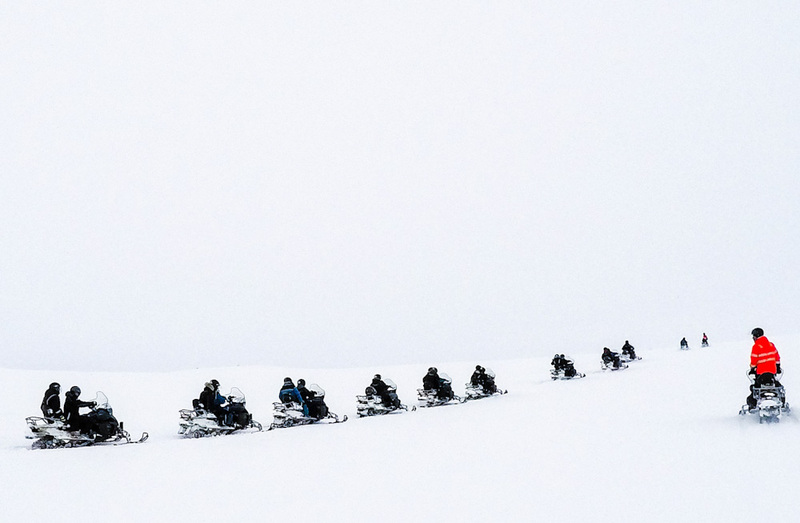 After a short briefing, we hopped onto our snowmobile and zoomed into the snow in a single file. The surface of the glacier is incredibly flat. With a thick layer of snow on top of it, it’s also super reflective. This can play some interesting tricks on your eyes. For one, I couldn’t tell the inclination of the ground that I was on. So if I was on a slope, I wouldn’t know. Very obvious inclination can be relativized with the horizon and so you know that you’re going down a steep (25+ degree) slope. But small undulations in the surface are absolutely invisible in these circumstances. This led to loads of fun where random people would just topple over. It was actually quite comical but very safe. The snow is very soft and fresh so toppling over meant that a guide would quickly come to your aid. They would help you pick up your snowmobile and jump right back into the fun. We rode in the snowmobile for about an hour. 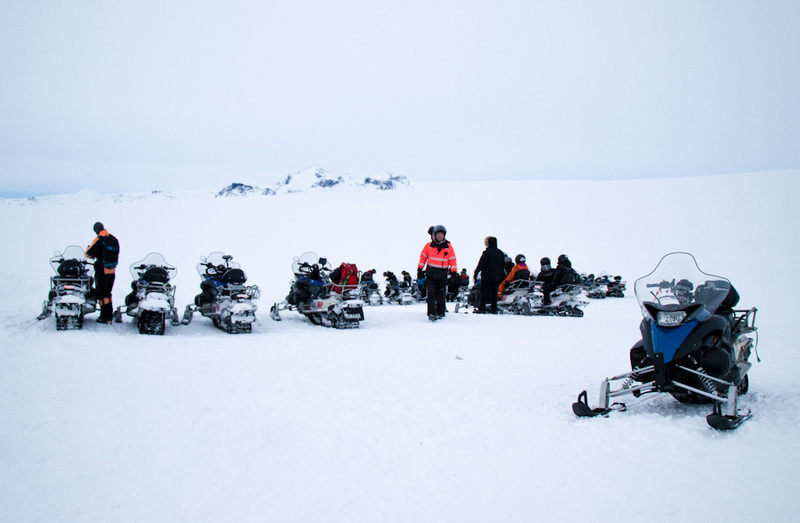 The wind can be quite cold and you don’t really get to forget that you’re on a snowmobile, on top of a glacier, in the middle of Iceland, in winter. The temperature was -10 degrees Celsius so we were grateful for the excellent equipment provided by the Mountaineers of Iceland. The ride into the glacier took us up and down several slopes. 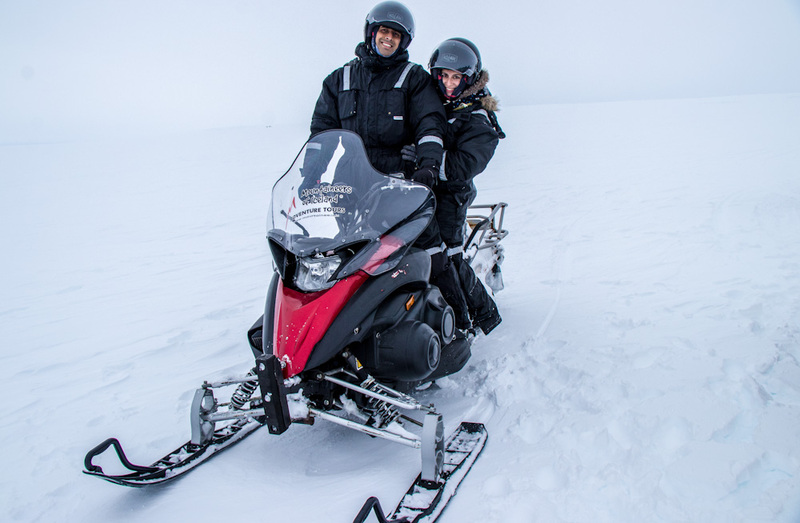 For the most part, though the terrain was flat and it was very easy to drive the snowmobile. 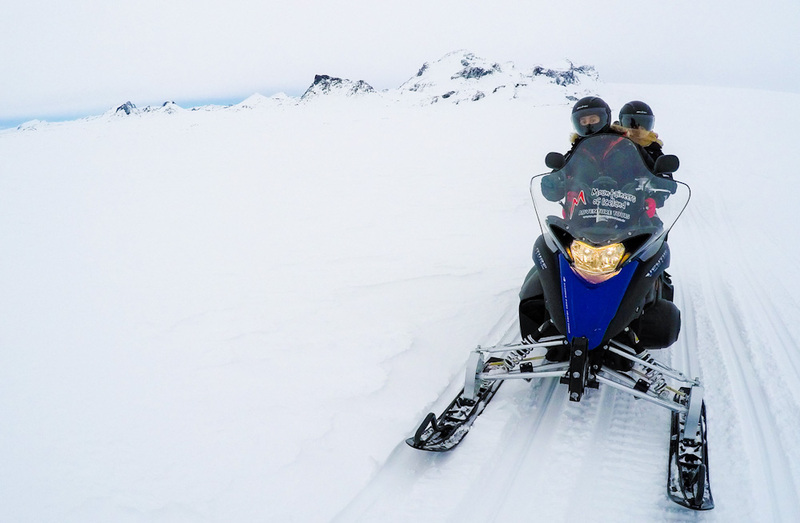 We reached speeds of up to 50km/hr at which point I felt quite cold and the snowmobile was effortlessly gliding over the surface of the glacier. It was definitely an otherworldly experience. The landscape was pristine and everywhere was just white backed by a deep blue sky. The jagged rock faces next to us leading up to the Atlantic ocean in the distance reminded me that I was so far from anything familiar and that, to me, meant that this was a real adventure! After about 30 minutes we made a stop to take some photos and turn back. I delightedly threw a few snowballs around with my faux leather gloves. 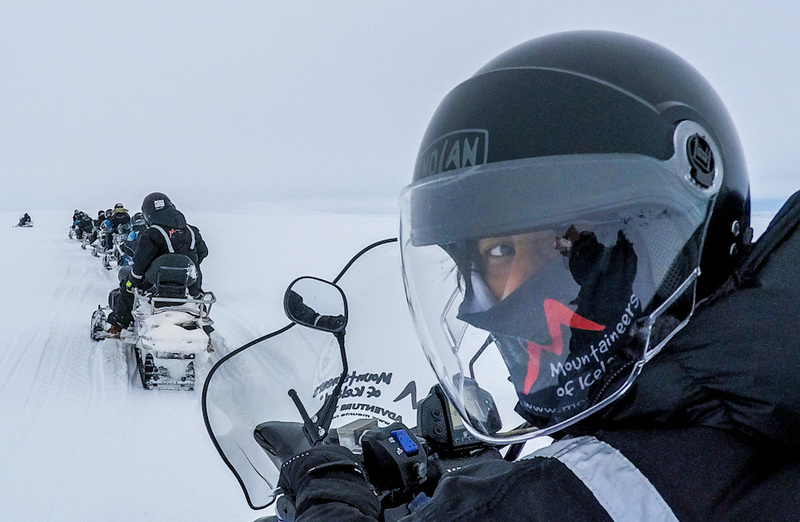 We hopped back onto our snowmobiles and headed back to the base camp. Now that we were more familiar with the machines it was easier to drive and I was far more confident. Still, the fact that I couldn’t tell whether we were straight or at an incline was quite a challenge! 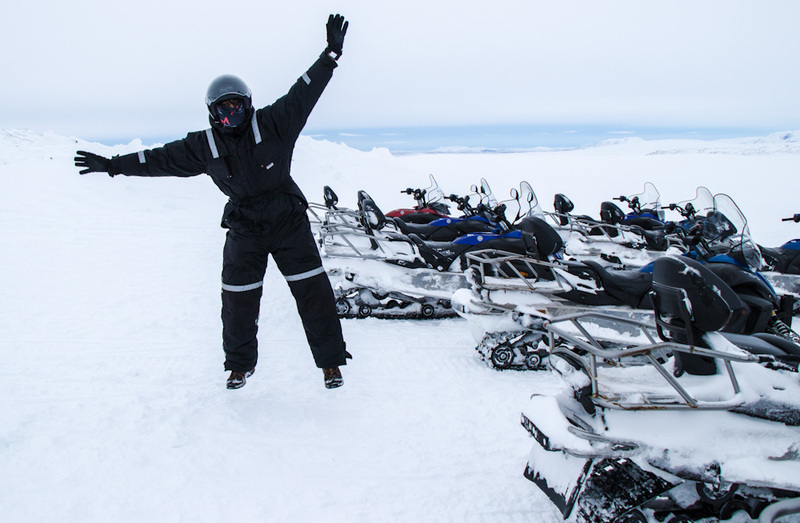 We reached the base camp safely and changed back out of our overalls and snowmobile gear. 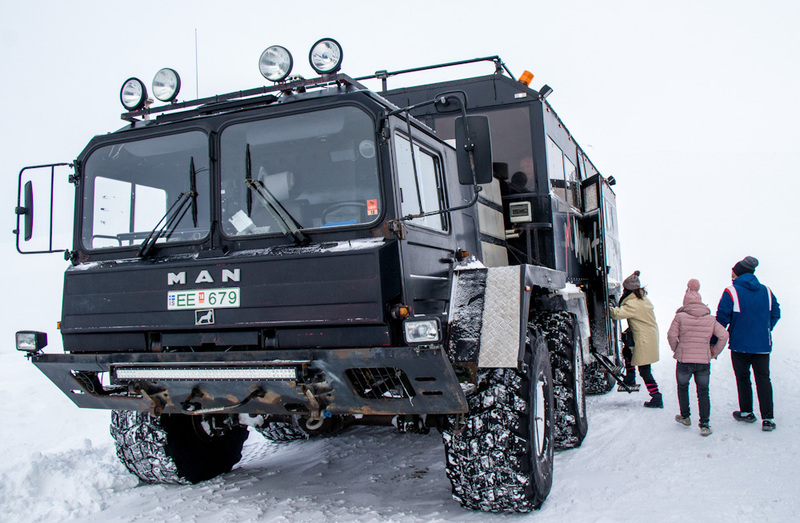 Then it was time to get back into the monster truck and drive back towards the meeting point. It had started snowing pretty heavily at this point so our journey back took a little longer than on the way in. However, we reached back safely and by this time we were all quite hungry. 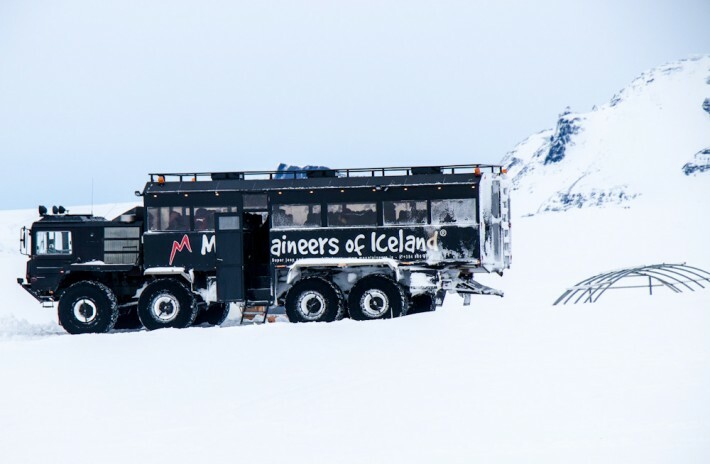 Mountaineers of Iceland monster trucks powers through it all! We lapped up a hot steaming bowl of soup that for once tasted like it was worth every crown we spent (food is quite expensive in Iceland) and I personally marvelled at the fact that I, the boy with the woollen gloves, had just been on a snowmobile, on a glacier, in the winter, in Iceland. What an adventure! This looks incredible!! What a great way to explore the snow! 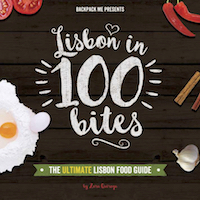 It must be great having most of the organisation done, too – it’s like easy intrepid travel. Love it, and adding it to my list! I like so much your story as we as your photography. 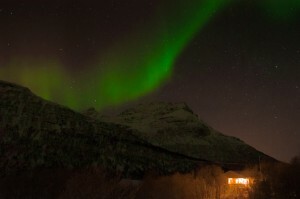 I’ve visited Iceland last winter season and it was quite hard to visit outside. So I definitely missed some similar moments that you shared. Loolz. 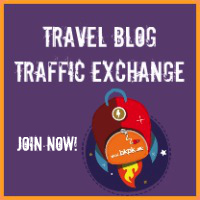 But thanks a lot and this post inspired me to start again for Iceland in this coming winter.